This article is about the TCG Booster Pack. For the OCG Booster Pack, see Collection Pack: Duelist of Revolution Version. 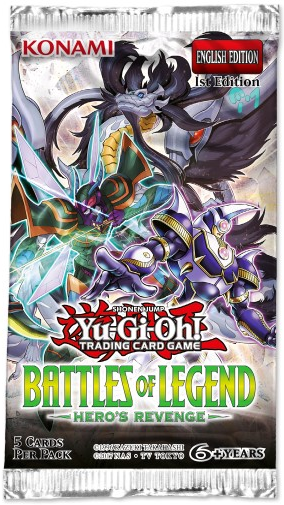 Battles of Legend: Hero's Revenge is a Booster Pack in the Yu-Gi-Oh! Trading Card Game (TCG). Includes new members and/or support for the "Black Luster Soldier", "PSY-Frame", and "Traptrix" archetypes. There are 5 cards per pack, 4 Ultra Rares and 1 Secret Rare. The set contains 93 cards. This page was last edited on 8 April 2019, at 22:25.